Hope your week end is a good one. Very cold here in the Chicago Land Area. Ughh! We got our first snow. Coming way to fast for me. I guess it does get you in the mood to decorate! 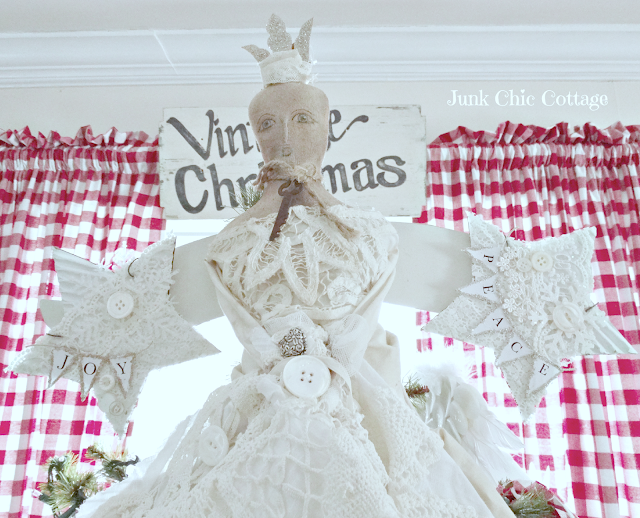 Here are a few more sneak peaks at the red I am adding to my whites and neutrals for Christmas Decor. My Angel is adorning the top of the Christmas Tree. I added a little bling to her wings with these star ornaments I got at Tattered Tiques Christmas Open House. Love these angel wings I got from the Halloween store after Halloween for $5. They make for a nice little addition to my chandelier. I added some of my crystal chandelier ornaments to the bottom of my chandy. I felt it needed a little bling to go with the angel wings above. I am loving just adding a little red here and there for my Nordic look. I am liking how the Christmas Decor is coming along. I will be sharing the whole completed Christmas Decor over at Pamela's My Front Porch to Yours How I found My Style Christmas Decor on December 7th. So for now just a few sneak peaks as I continue to tweak and change things up. I know a lot of you are starting this week too. Happy Decorating. OK now for a sweet story and thank you to share with you on this Sunday. I was telling my friend Vera a story about my Outside Fall Decor from last year. In my garden bike I had some burlap and lace liners and then some pumpkins and fall decor in the baskets of the bike. One Day I came home from running errands and I noticed that someone had taken out the burlap and lace lining I had in the baskets. They left all the other stuff just took the lining. I thought why would someone just take the lining?? Too weird and I kind of let it go. The leaves were still thick on the trees and falling. Later on in the month when all the leaves were down from the trees I was coming home again and looked up in the tree to see my resident squirrel's nest up in the oak tree. Yep! I think you know where my burlap and lace linings went!!!!!!! The squirrel thief took my linings and made a beautiful condo for himself up in the old oak tree. I could not be mad as I thought wow that is the prettiest squirrel nest I have ever seen. Just made me smile all winter long and it was a long long winter!!!!! Vera at Row Homes and Cobblestones saw this cute ornament and she said it reminded her of my cute squirrel story and she wanted to send it to me. Is he not the sweetest!!! So now when I am on my computer I will see this special little squirrel that Vera gifted me. Thank you sweet friend for this wonderful sweet remembrance but most of all thank you for the sweet friendship you have gifted me in blog land. Have a wonderful week everyone. Lovely, lovely, lovely ... nobody does white like you Kris. The touches of red are perfect. I'm liking the touches of red gingham you're using for Christmas. That is the cutest story about what happened to your things. I wish you had taken a picture of that nest! What a great story with the squirrels' condo. Lovin' the reds coming through, Kris. Good Morning Kris, What a lovely post all that white with touches of red gingham . . . gorgeous. 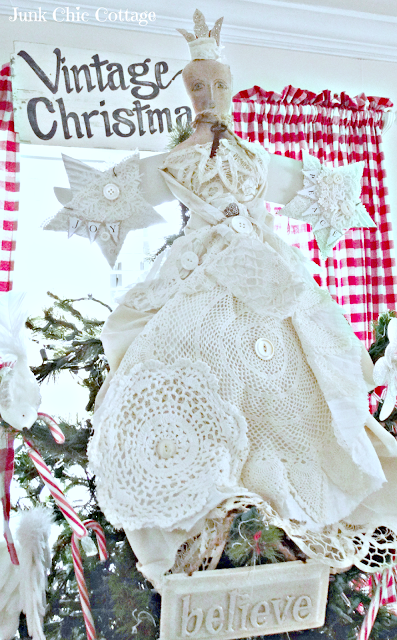 Love your angel tree topper and those little star ornaments that you added are adorable. I'm going to try my hand at making some like those, thanks for the inspiration. I agree, that red just makes everything look much more festive and special! It's pretty hard to get mad at those squirrels when they're so darn entertaining! Just think what they could do with a pair of those wings!! I'm loving the touches of red in your all white decor, Kris! It makes me want to unpack my Christmas stuff, but I've got to wait until after Thanksgiving. I can't wait to see your Christmas feature! Love the sneak peeks you have been giving us, Kris! I can't wait to see it all. I am loving the red Nordic additions to your home for Christmas. 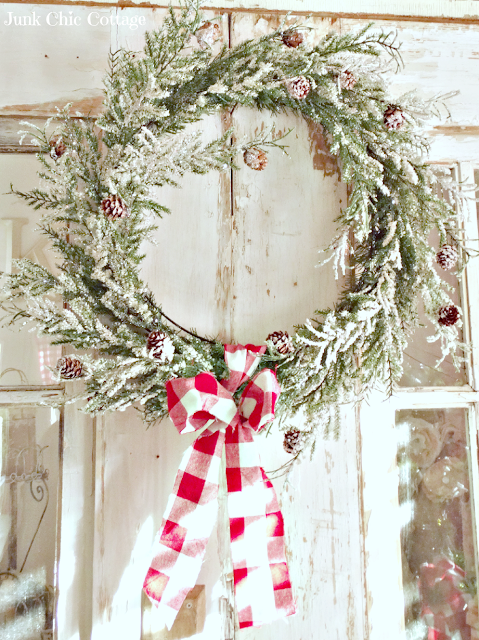 The wreath is gorgeous, especially with the red touches in the bow a bit of snow flocking. Also the other wreath with joy to the world in it is stunning. Kris thanks for the mention but it was you that brought laughter to my day hearing about your inventive stealing decorator squirrel. Diana too has a funny squirrel story to tell, love the stories and shares ... My crazy squirrel who honestly thinks he's our pet keeps us amused. Thanks for retelling the story, I just read it to John and he too enjoyed it. Yesterday I was out and about goofing and didn't check out any blogs, yikes I'm behind on my favs! Happy day my friend, stay warm and cozy it sure feels like winter! First of all, I'm LOVING the pops of reds with your pretty whites...love, love, love that combination. And the squirrel story is too darn cute! Yes, Vera is a real doll and lovely friend. Love the fun story and your fun little squirrel! Your decorations and the red is so pretty, Kris! I planned to do red, too, but when I got going I realized it wasn't as red as I thought! LOL! It's in there, though! Love the touches of red for the holidays. And those little chandy ornaments are darling! Love the touches of red with all of your beautiful white! What a sweet gift! It IS a funny story, and nice of you to see the humor in it! Love those angel wings, we never know when a great find will appear now do we? And blog friend really are the best! Love the red Kris! This is definitely a tease! I can't wait to see more. 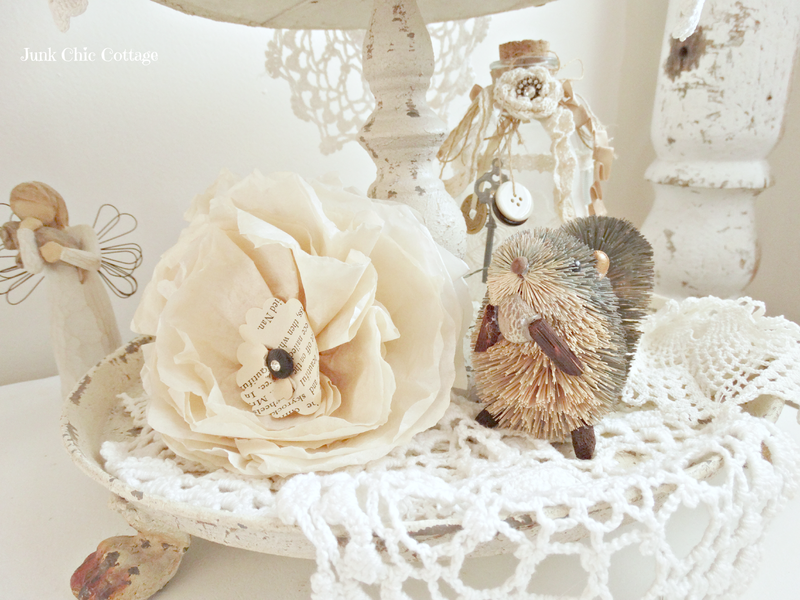 And so funny that you're now decorating squirrel nests ...love that story so much! Have a wonderful week Kris! Would have loved to see that nest! I love, love your red touches. The angel wings, the wreath, the sweet squirrel...your home is rich of beauty. Yep snow here too, and bitter cold. 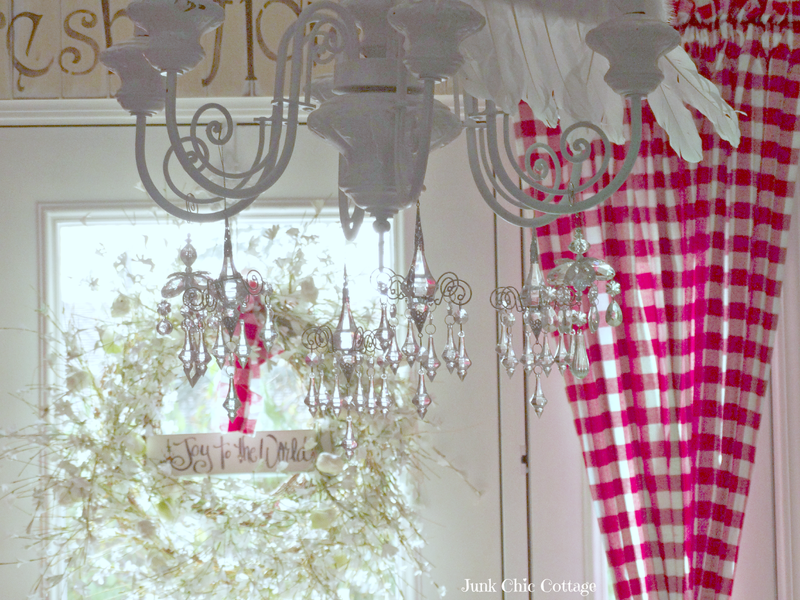 I am loving all the gingham and the wings on the chandy are a brilliant idea. Perfect Christmas decor. Great story! I hung some prayer flags in my pergola and had the same thing happen. Resourceful little rodents. I guess if we want pretty nests in the trees we need to provide pretty makings! I love your story. How fun. Keep us posted on how that squirrel does during the Winter. Kris I really love the red, it's just perfect. Kris I love love love all the pops of red with your white...your Christmas peeks look fabulous!! What a sweet story and sweet little squirrel! Love all the red and white as you know and your story cracked me up. Yep, that squirrel has one fancy house. 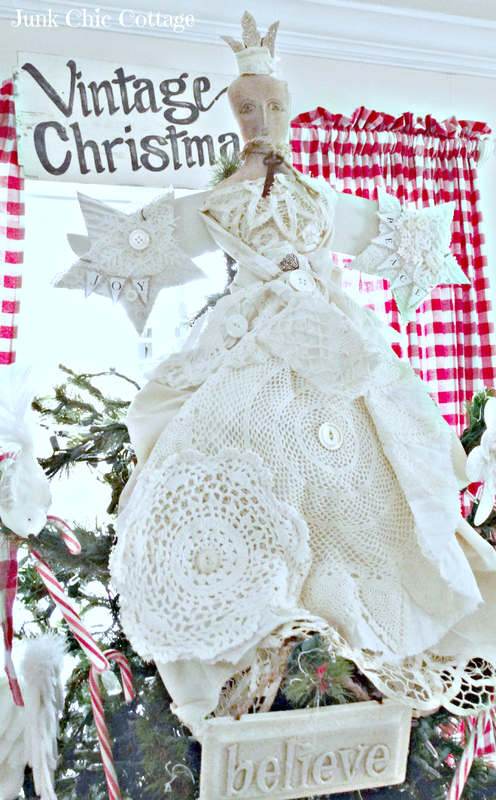 Love the red touches with your whites for Christmas...so pretty! Bet that squirrel has the prettiest nest in the neighborhood!! So funny that the squirrel has such good taste. We have a resident squirrell. He teases the dogs. My husband used to bring home nuts forhim until he tried to chew his way into the house in several places. No more Mr. Nice Guy. I love the red and white. Oh, so lovely Kris and the touches of red are just perfect. Have a wonderful start of the wek. Oh Kris, I love the red plaid with all your white. It looks terrific. Your really ahead of the game with your decorating - I hope to get cracking as soon as I finish a order that I have for 7 wreaths. The story about the squirrel is so funny - he wanted his condo to look pretty also. Sorry that you are having such cold weather. It's going down in the 50's tonight and I am freezing LOL. I would probably die if I had to go back east in the cold. What a lovely story, Kris! That squirrel sure has good taste. Love the touches of red and white...enjoyed the "peek". Have a great week! 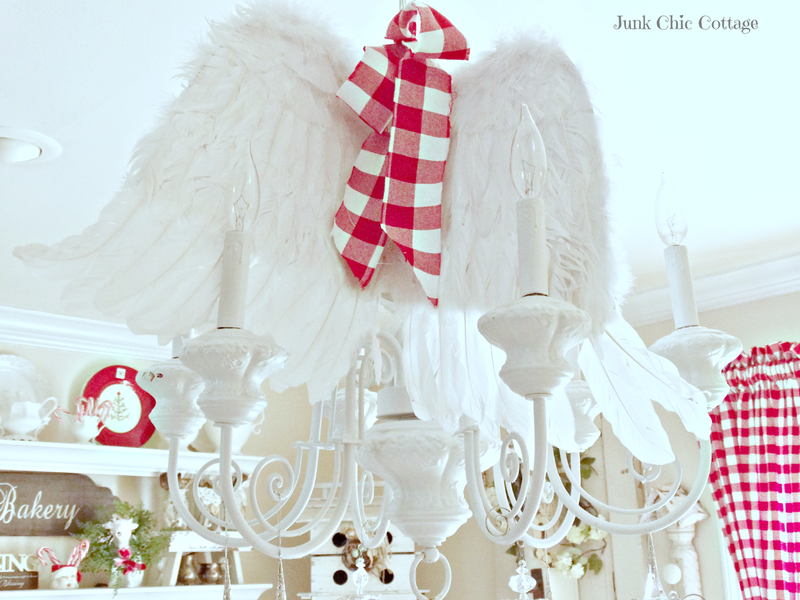 Angel wings with the chandy! Brilliant! 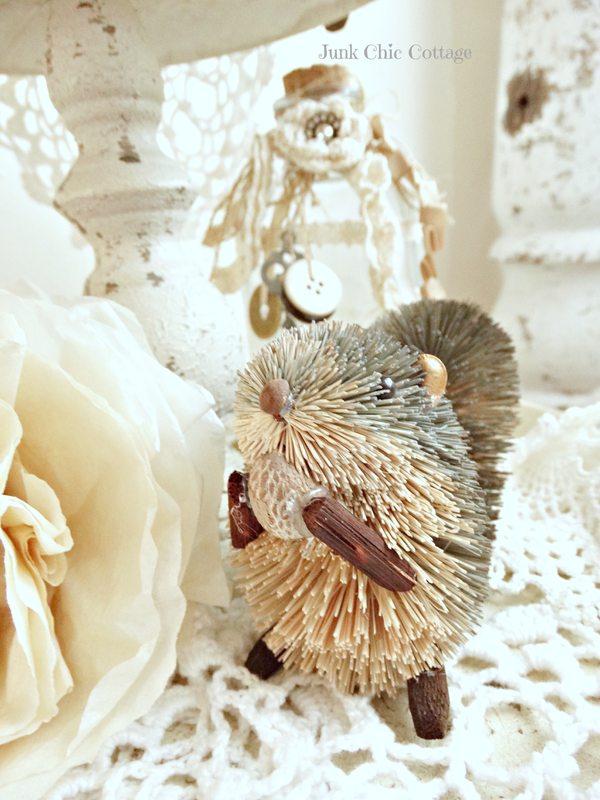 You even got the squirrel to love vintage shabby decor, Kris. cute squirrel story, kris:) your angel makes a great topper, and i can't wait to see your xmas tour! oh my goodness......that is one smart romantic shabby squirrel. I have that squirrel, to! He was a gift from my SIL's boyfriend a few years ago. How sweet of Vera! I am in love with your squirrel story, Kris. At least he is a designer squirrel and not some ragamuffin without any proper design skills. I am loving the sneak peeks and can't wait until December 7th. I love Vera, love the squirrel story and I love your little squirrel to remind you. Loving the touches of red and the angel wings are beautiful! I really like the bling added to the chandy. :) You are a pro at decorating. I'm thinking the squirrel was a female ~ she might be preparing for little ones. She could be decorating for the holidays too. Great story! Loved the peek at your red and white decor!! Can't wait for the full reveal! That is the cutest story about the squirrel thief! Lol! That's actually pretty smart to realize that liner would make a great condo! :) I have a window box with a coconut liner and the birds are always stealing bits of the liner for their nests. So funny! No Pictures Just Honest Thoughts.